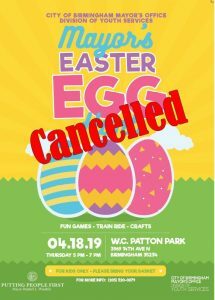 Mayor’s Easter Egg Hunt 2019 Cancelled! Due to the threat of inclement weather, the Mayor’s Easter Egg Hunt has been cancelled. All non-emergency City of Birmingham offices will close at 3:30 p.m. today, April 18th.